From amazing costumes to fun puppet theaters, the possibilities for crafting with cardboard boxes are endless. We recently stumbled upon another brilliant display of box recycling – a Millenium Falcon replica complete with a cockpit sized perfectly for a toddler Han Solo. Die-hard Star Wars fans, the Karpiuks, parents of little Liam shown above, spent four months crafting this amazing cardboard box art. Keep reading to see how they did it. 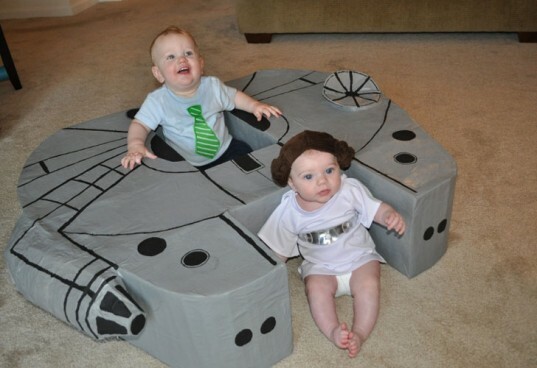 After the Karpiuks, like many parents, watched their son find more delight in a large cardboard box than the Exersaucer toy that came inside, they decided to transform it into something awesome – the Millenium Falcon. Besides the big box, they used a few extra boxes for additional framework, papier-mache, packing tape, silver spray paint and a lot of creativity to make the recycled masterpiece. You can see the progress from start to finish here. For even more fun, they gave Liam a Han Solo vest and the family’s Schnauzer wore a Chewbacca bandolier made out of craft foam. A little friend even came over dressed as Princess Leia. Too cute! From amazing costumes to fun puppet theaters, the possibilities for crafting with cardboard boxes are endless. We recently stumbled upon another brilliant display of box recycling - a Millenium Falcon replica�complete with a cockpit sized perfectly for a toddler Han Solo. 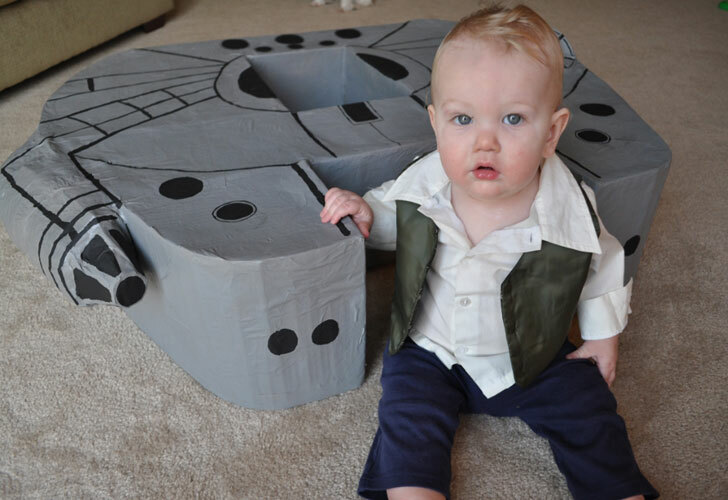 Die-hard Star Wars fans, the Karpiuks, parents of little Liam shown above, spent four months crafting this amazing cardboard box art.�Keep reading to see how they did it.